The music is a special feature for the Ball with the Coalbrook Band handling the large diversity in dance styles with great accomplishment. Again this year we will enjoy the musical talents of the entire Strutt family (Helen & Greg, Jennifer & Catherine) plus the great fiddle expertise of Chris Duncan. A little touch of Irish and Scottish, Colonial expertise to burn, some Welsh influences, 17th English - and who knows what other surprises may be in store for us? There will undoubtedly be a Hambo snuck in before one of the breaks! 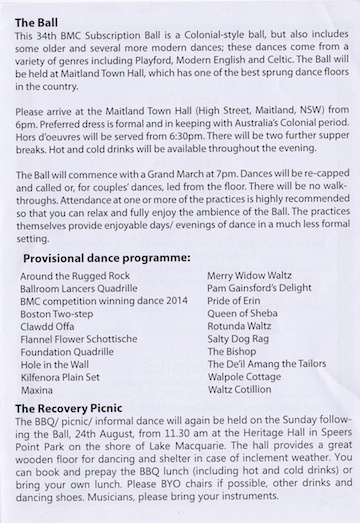 Dance instructions will be made available in PDF format once the programme has been devised and the specific versions of each dance have been determined. 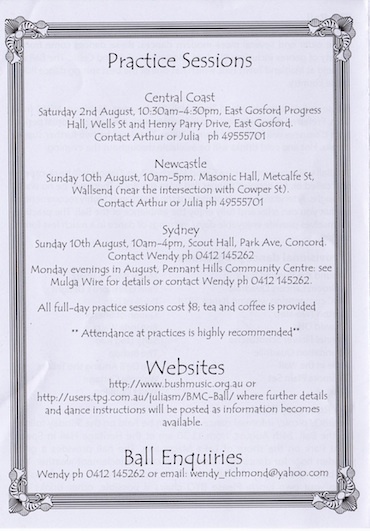 Keith Wood has animations of numerous dances on his Dance Kaleidoscope Web site (http://www.dancekaleidoscope.org.au/dance.html). (Note: you may have to use a browser such as Google Chrome instead of Internet Explorer). 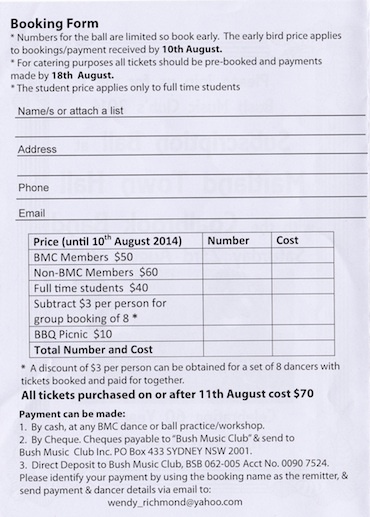 Dancers should be cautious when using viewing any of the ball dances on YouTube etc. or using instructions found on the internet as different versions exist, particularly for the Playford dances and the multi-figure quadrilles. take the Kurri Kurri Interchange (second exit), turning right onto Main Road through Heddon Greta and Gillieston Heights (!) to Maitland, cross the New England Highway and the railway and turn right to the Town Hall. 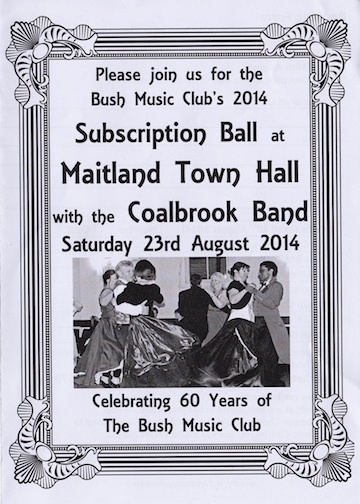 Bush Music Club's 30th Subscription Ball, Maitland Town Hall.